The pressure from capital outflows has been "alleviated" recently, but China will continue to study ways to curb illegal foreign exchange speculation, Wang Yungui, head of the general affairs department at the State Administration of Foreign Exchange (SAFE), said Tuesday. According to a previous statement released by SAFE on March 16, China's foreign exchange deficit in the country's non-banking sector narrowed to $35 billion in February, down 50 percent compared with January. This was caused by multiple factors, such as the stabilizing global financial markets and the relatively steady yuan exchange rate, SAFE said. The yuan showed signs of stabilization after weakening since August 2015, when the government launched a more market-oriented central parity system. The slide contributed to capital outflows of about $1 trillion in 2015, Bloomberg reported on March 15. 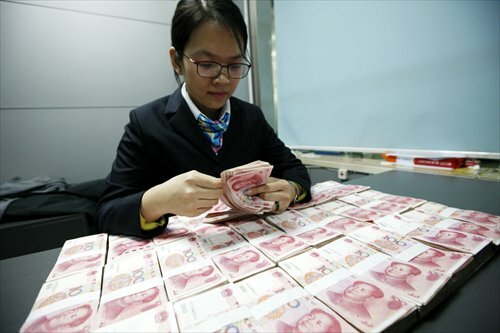 Zhou Yu, director of the Research Center of International Finance at the Shanghai Academy of Social Sciences, cautioned that as the US Federal Reserve is likely to raise interest rates shortly, the yuan may see further fluctuations in the near future, presenting risks of further capital outflows. Wang also said that a new US rate hike would exert pressure on China's cross-border capital flows, and would increase the pressure on foreign exchange management. China has already made plans to deal with the next interest rate rise by the Federal Reserve, Wang said, but didn't disclose what the plans are. Zhou said that the Chinese government should make plans in preparation for the "worst situation," as a decline in foreign exchange reserves can easily stimulate a mood of apprehension in the domestic markets, and it might be too late for the government to start thinking about countermeasures by that time, he told the Global Times on Tuesday. Xi Junyang, a professor with the Department of Finance at the Shanghai University of Finance and Economics, told the Global Times on Tuesday that in cases of market panic, the government can use administrative measures to tighten controls on capital flows. But he cautioned that those measures should only be used in emergencies, and that the government should tolerate capital flows as a normal phenomenon in the financial market. Wang also noted that China has many tools to manage capital flows. The tools used so far may be enough, but the government will continue to study other options, including the Tobin tax. "We are studying whether we should levy the Tobin tax on short-term cross-border capital flows in the country," Wang noted. First proposed by American economist James Tobin in 1972, the Tobin tax is imposed on currency transactions in an effort to curb speculation in the foreign exchange markets. According to a Reuters report on March 19, Yi Gang, deputy governor of the People's Bank of China, the central bank, said in October 2015 that the Chinese authorities are studying the Tobin tax as a possible way to curb currency speculation. The Bloomberg report on March 15 also noted that the initial rate of the tax may be kept at zero to allow authorities time to refine the rules. Zhou said that compared with capital controls, the Tobin tax would be a better way to curb speculation. "As the tax rate is low, it would have a limited impact on normal transactions, but would significantly increase costs for capital speculators, as they tend to convert currencies with high frequency and in small values," he noted. He said that the Tobin tax policy had been used in Chile with good effects. Xi, however, said that while the Tobin tax targets capital speculation, it's very hard to give an exact definition for such behavior, and the tax might also hurt normal transactions to a certain extent.